Since hoverboards came onto the scene a few years ago, children and adults around the country have enjoyed using these devices. They still remain one of the hottest electronics on the market and were probably under many trees this past Christmas. The self-balancing scooters are clearly a popular source of entertainment. However, they aren’t all fun and games. Instead, hoverboards are also known as being a source of potential explosions and fires. And unfortunately, these incidents are not new. When hoverboards were initially released, a host of reports regarding injuries caused by them fluctuated into the media. 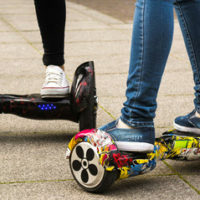 This was the case to the extent that even back in 2015, the Consumer Product Safety Commission announced that it was investigating the substantial reports of fire-related hoverboard injuries across the country. Though you may have forgotten about this influx of incidents, the reality is that they are still occurring, even right here in our community. According to WESH 2 News, one Palm Coast family recently reported that their home was destroyed in a fire after a hoverboard recently given as a Christmas present exploded. Fortunately, all family members present in the home at the time of the fire survived the blaze that was described as being “intense” by investigating authorities. This makes it clear that people are still incurring injuries as the result of hoverboards. But this also gives rise to another question – who can be held responsible? What Injuries Can Be Caused By Hoverboards? It depends. Companies are generally responsible for placing defective products on the market. Therefore, if you or a loved one is harmed as the result of a defective design or manufacturing defect in a product, including a hoverboard, the company who placed the product into the marketplace will likely be held responsible. What Safety Tips Can Help Prevent Hoverboard Injuries? Always remain in the room when your hoverboard is charging. Make sure your hoverboard is being charged in a clean, dry area. Have You or a Loved One Been Injured as a Result of a Defective Hoverboard? Incurring an injury from a beloved toy is always a tragedy. However, obtaining compensation from the responsible parties should not have to be. The Orlando products liability attorneys at The Pendas Law Firm can help ensure that you recover the maximum compensation that you are entitled to while you focus on recovery. Contact us today to schedule a free initial consultation.